Emerson Electric Co. (EMR) operates as a diversified technology company worldwide. It engages in designing and supplying products and technology, and delivering engineering services and solutions to industrial, commercial, and consumer markets. This dividend aristocrat has paid uninterrupted dividends on its common stock since 1947 and increased payments to common shareholders every for 55 consecutive years. There are only twelve companies which have managed to raise distributions for over 50 years in a row. The company’s last dividend increase was in November 2011 when the Board of Directors approved a 15.90% increase to 40 cents/share. Emerson Electric ‘s largest competitors include Roper Industries (ROP), Cooper Industries (CBE) and Ametek (AME). The company has managed to deliver 11.10% in annual EPS growth since 2002. Analysts expect Emerson Electric to earn $3.49 per share in 2012 and $3.98 per share in 2013. 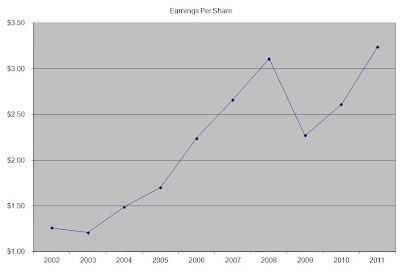 In comparison Emerson Electric earned $3.24/share in 2011. 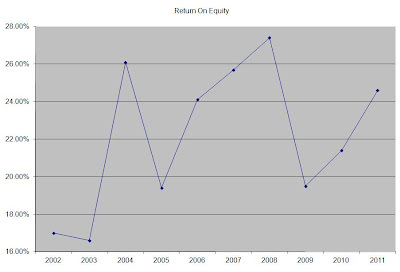 The company has managed to maintain a consistently high return on equity over the past decade. Rather than focus on absolute values for this indicator, I generally want to see at least a stable return on equity over time. The annual dividend payment has increased by 6.60% per year over the past decade, which is lower than to the growth in EPS. 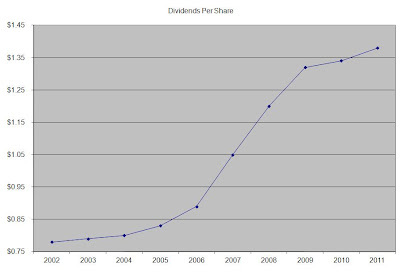 A 7% growth in distributions translates into the dividend payment doubling almost every six ten years. If we look at historical data, going as far back as 1983 we see that Emerson Electric has managed to double its dividend every nine years on average. 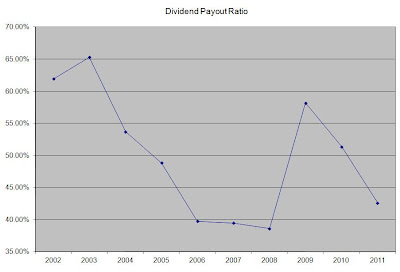 Over the past decade, the dividend payout ratio has been on the decline, falling from a high of 65% in 2003 to 42.60% in 2011. A lower payout is always a plus, since it leaves room for consistent dividend growth minimizing the impact of short-term fluctuations in earnings. Currently Emerson Electric is attractively valued at 16.60 times earnings, has a sustainable dividend payout and yields 3.10%. I would consider adding to my position subject to availability of funds.